Back in my earliest sign painting days (when we still painted signs instead of sticking vinyl) my least favorite thing was the second side of a vehicle. That second door was no where near as exciting as the first one. The cure for me was to paint them both at once. I would hop from side to side on the vehicle painting one or two letters on one door and jumping to the other side to do the same. If I didn't do that it would be drudgery to do what I had already done. The fact that trucks have two doors was probably one of the main reasons that made me persue other forms of sign making where I could do different things all the time. I'm sure they have a pill for that now but I'm pretty happy doing things the way I like to do things. 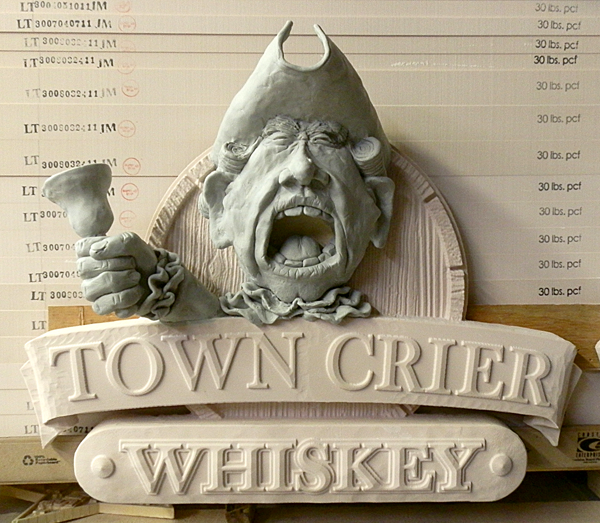 I decided to do a second copy of the Town Crier Whiskey sign as a sample for my studio. It wasn't long until I felt those same feelings of old. I handled it the same old way, jumping from sign to sign, keeping them about equal in completion. But I also did something I couldn't ever do with truck doors. I didn't make them identical. Each, while similar in some was is also quite different. Each time I work on the the two signs my favorite becomes the one I am working on. As I switch, so too does my choice. I'll let the owners of the pub pick the one they prefer and I'll keep the other. That keeps things nice and easy (for me). Now we are on to paint! Color brings Charles to life!